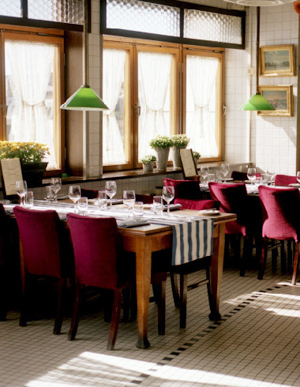 This culinary institution from the 1930s offers one of the most spectacular vistas in Stockholm. Partially suspended beneath a pedestrian footbridge that connects the island of Gamla Stan with the island of S�dermalm, it requires access through a (free) private elevator from the Stadtsg�rden. This elevator will haul you up the equivalent of 11 stories to a restaurant with a decor that hasn't changed much since it was built as an engineering oddity in 1935. The bar is cozy, and the dining room is well managed and very popular; gentlemen usually wear jackets and ties. Menu items reflect a mixture of French and Swedish cuisine. For appetizers, take delight in such servings as bleak roe with a warm onion and cauliflower sauce, or else risotto with truffles. From the grill emerges such sublime dishes as red trout or filet of Swedish lamb, served with tarragon butter. Grilled filet of pike-perch is one of the chef's special dishes, as is breast of corn-fed chicken with a sherry sauce and a side of grilled vegetables. The talent of the kitchen keeps local habitu�s returning, and hotel concierges often recommend this restaurant to guests seeking excellent traditional fare.